Being an over eager beginner, the first project I ever took on was a top down cardigan from Plymouth. Let it be known that I soon convinced Stacy this was going to be a good idea...new or not we were going to conquer the knitting world! 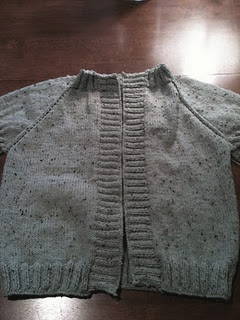 She didn't fall for it at first but after seeing the finished results casted on for her own cardigan. The cardigan itself is a fairly simple construction but being new to knitting it was a challenge none-the-less as reading the pattern was like learning a foreign language. I chose the exact yarn intended for the pattern, Plymouth Yarn Encore Worsted Tweed in a beautiful shade of pale green. I've since then started the same pattern in a gorgeous pink baby alpaca I purchased at my local LYS. I think this pattern is definitely a keeper for a no fail closet staple! Happy Knitting Everyone!